We were on our way home from an event at Asbury Lanes when we pulled into a local rest stop. Looking for coffee, gas to fill our tank and a functioning restroom (Not necessarily in that order.) It was about 2:30 am and the road was black as … well, you know. 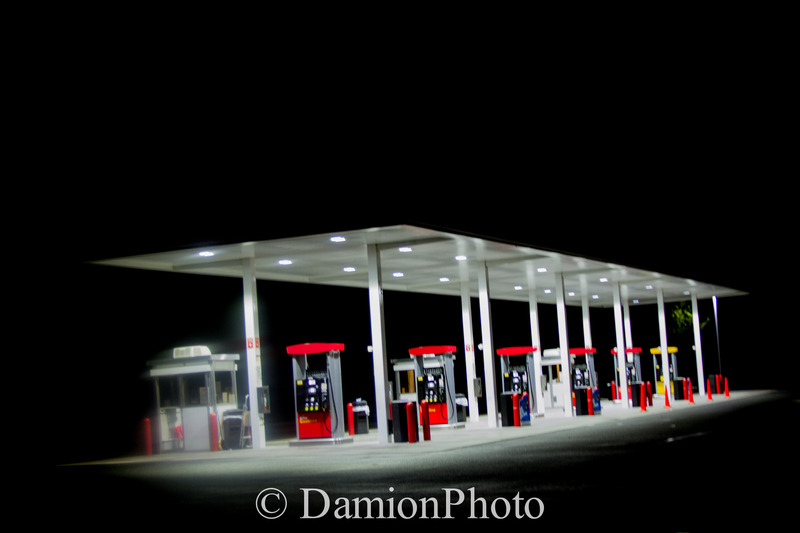 There was not a street light in sight and with the exception of the glow coming from the gas station there was nothing. As we headed back to the car I became hypnotized by the amount of power that small outpost resonated. I’d liken it to something out of Star Wars with the mighty and ominous Death Star floating amongst the constellations. With my wife in the car and the engine running I steadied myself as not to create any unwanted camera shake and took my shot before heading back to the car and my now cranky wife. More and more, I find myself realizing that it’s not the events I shoot that reward me with my favorite images. It’s the long ride home. You and your wife are just like my husband and I. We love road trips and all the cool stuff you encounter. Some of our best photo memories are from the drives also. We always stop and pull over to shot something (My husband is a professional photographer, I’m not but I use the camera often nonetheless). We absolutely love all the rest areas, truck stop diners, etc. that make being on the road fun. It’s all part of the journey.